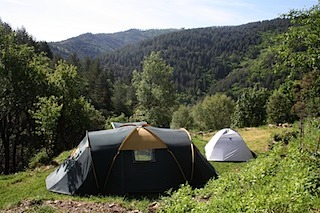 Discover the unspoiled nature of the Cévennes while camping comfortably under the stars on our Eco camping at the foot of Mont Lozère in a landscape on UNESCO’s list of world heritage. On a spacious site (4500 sq.m.) on the banks of a crystal clear brook, seven wonderful camping spots have been created. Surrounded by a terraced landscape with sheltered fields and meadows, fruit trees, vegetable gardens, water basins and irrigation canals which are shaped and processed by man over the centuries. For you to enjoy a unique camping experience, in 'glamping style' (glamorous camping) or ‘sporty luxurious style’, or just to enjoy camping in all its simplicity, in the middle of nature. Away from sounds and smells of traffic. Cars remain on the parking lot (100 m. away). From there you can transport your luggage with the wheelbarrow available for just that purpose. For those who prefer a more classical style of camping; close to the grass, the reading in the hammock, camping gadgets; who like comfort but do not like traveling with extensive camping equipment, we have installed a very nice and spacious Tent with full camping commodities. For those who prefer camping with their own equipment, some beautiful campspots are available. The sanitary block is centrally located and provides you with shower, dry toilet washing and dishwaching facillities as well as a fridge to share with the other camping guests. Laundry: a washing machine is – on payment – at your disposal in the ‘launderette’ in the Mas.